(Bloomberg) -- Even after losing a third of its market value over the past year, Mylan NV hasn’t been able to win back investors. “This is a name where sentiment is really, really bad,” Evercore ISI analyst Umer Raffat told clients last week, after visiting with investors. Raffat was quick to defend the stock in light of the feedback, reiterating his bullish stance. 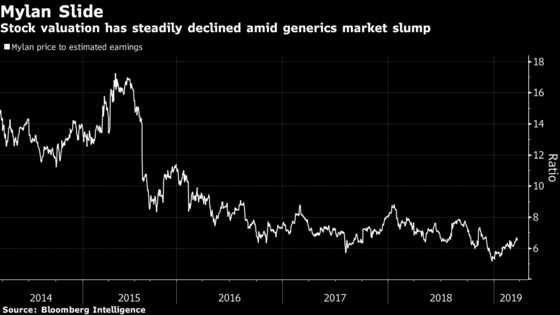 Mylan is the second-worst performer among global generic and specialty pharma peers over the past year, trailing only Perrigo Co. Mylan’s forward price-to-earnings ratio has fallen to 6.4, the lowest in the S&P 500 Pharmaceuticals Index. The company has also missed revenue estimates in seven of the past eight quarters and expects adjusted cash flow to decline this year amid a turbulent generic-drug market. The shares fell 1.6 percent at 1:32 p.m. in New York amid a broad market slump. Mylan has gained 5 percent so far in 2019, in-line with the S&P 500 Health-Care Index. The investor cited Mylan’s earnings misguidance, manufacturing problems at a major plant in Morgantown, West Virginia, in addition to drug-approval delays. Mylan’s generic version of Allergan’s top-selling eye drug Restasis, for example, was expected in late February, but almost a month later, “we haven’t heard anything,” BI’s Wanek said. Another drug, a copy of Glaxo’s top-selling asthma therapy Advair, was approved three months later than the Canonsburg, Pennsylvania-based company had forecast. Spokeswomen for Mylan didn’t immediately return requests for comment. Despite the setbacks, Evercore’s Raffat sees business trends improving and this year’s earnings forecast as “very conservative.” He said that generic Advair is off to a good start, with prescriptions reaching more than 30,000 in the week ending March 8. That compares to brand Advair prescriptions of more than 100,000 during the same period, Symphony data show. Raffat also sees potential for meaningful growth over the next three to five years from uptake of Mylan’s new biosimilar medicines. “It’s the first opportunity in a long time to have a truly product-cycle driven organic growth,” he said by phone on Wednesday. Raffat is one of 13 analysts covering the stock with a buy rating or equivalent, while six say hold and none recommend selling the shares. At the same time, the gap between where the shares are trading and the average analyst price target is near the narrowest its been in more than a year, suggesting less potential upside for investors.